What Magnification are Diamond Clarity Photographs? What does an I-1, I-2, I-3 clarity diamond look like? What does an SI-2 clarity diamond look like? Will this SI-1 clarity diamond face-up eye clean? VVS-1 clarity diamonds, can you see it? Internally Flawless – What is there to see? So, which diamond clarity should you choose? Which you probably don’t find to be all that helpful either, because a one-dimensional plotting diagram of a diamond is not an accurate representation of how visible inclusions may appear within a three-dimensional translucent crystal, right? The GIA diamond clarity scale consists of six categories which are divided into eleven grades. The majority of diamonds purchased by our clients for engagement rings fall into the VVS, VS, or SI-clarity grades because they want their diamond to face-up eye clean. 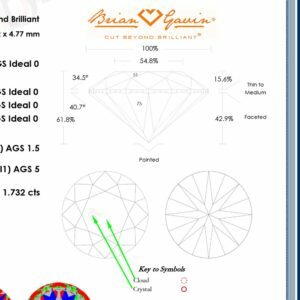 Brian Gavin does not sell diamonds in the lower clarity grades of I-1, I-2, or I-3 range. Using the GIA system for grading diamond clarity, a grader will take into consideration, the size, nature, position, color or relief, and quantity of clarity characteristics, as determined using 10x magnification. Flawless (FL) - No inclusions or blemishes are visible to a skilled grader using 10× magnification. Internally Flawless (IF) - No inclusions and only blemishes are visible to a skilled grader using 10× magnification. Very, Very Slightly Included (VVS1 and VVS2) - Inclusions are difficult for a skilled grader to see under 10× magnification. Very Slightly Included (VS1 and VS2) - Inclusions are minor and range from difficult to somewhat easy for a skilled grader to see under 10x magnification. Included (I1, I2, and I3) - Inclusions are obvious under 10× magnification and may affect transparency and brilliance. Diamonds are created deep within the earth under conditions of extreme heat and pressure. Diamonds may exhibit clarity characteristics (flaws) known inclusions (internal clarity characteristics) or blemishes (external clarity characteristics). Some people say that no two diamonds are alike and that each diamond is unique in the composition and formation of the clarity characteristics which it contains. Thus, you might choose to view the location and structure of the clarity characteristics within your diamond as being similar to a fingerprint or birthmark. We use these clarity characteristics to determine the rarity of the diamond, as compared to other diamonds which may contain more or less inclusions, or inclusions which are more or less noticeable under laboratory grading conditions. The industry standard for diamond clarity grading is 10x magnification. However, we usually use a gem scope with higher degrees of magnification during the evaluation process to be able to identify inclusions more easily. The majority of people buying a diamond engagement ring prefer to not to be able to see inclusions or flaws within the diamond with just their eyes. With that in mind, we recommend that you focus on diamonds which are VS-2 or higher in clarity. While there are some SI-1 and SI-2 clarity diamonds which face-up “eye clean” it is important to understand that clarity is largely a matter of perspective. The apparent ability to locate the inclusions within a diamond with just your eyes, depends on the individual vision of each person and the lighting conditions under which the diamond is being viewed. With this in mind, let’s get I-1, I-2, and I-3 clarity diamonds out of the way and build our way up to the higher clarity grades from there. 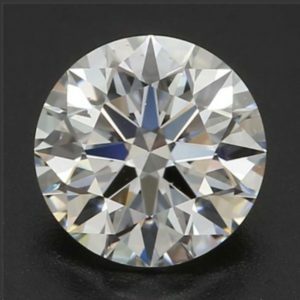 The majority of I-1, I-2, and I-3 clarity diamonds that you’ll find in the market are what the industry deems to be “promotional goods” which are so heavily included that they appear to look “dead” because they are so dull and lifeless, due to the heavy concentration of flaws within the diamond crystal. Many traditional brick and mortar jewelry stores use lower clarity diamonds like these as “lost leaders” in advertising to draw people into the store in hopes of buying a one carat diamond for $1,995 – 2,995.00 but WOW are most people surprised when they discover that the diamond they came in to buy looks like a piece of crushed rock quartz! Of course they do, but thanks for making me think that I could buy a nice looking one carat diamond engagement ring for only $1,995 – 2,995.00 because now I’ve got that idea stuck in my head and it’s such a bummer to come down from there, right? SI-clarity diamonds are “semi-included” which means that a trained grader was able to identify the inclusions “readily and immediately” using 10x magnification, which is the industry standard for diamond grading. 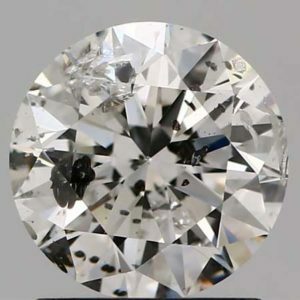 Depending on the nature of the inclusions, their size, location, and the degree to which they are visible, a diamond may be graded as SI-1 (the higher end of the spectrum) or SI-2 (the lower end of the spectrum) but it is important to realize that each clarity grade represents a range of possibility. Which means that there some SI-1 and SI-2 clarity diamonds will be better (or worse) than others. 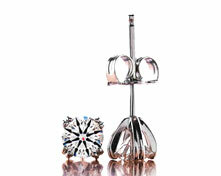 For example, you might be comparing two SI-1 clarity diamonds, and one appears to be less included than the other. Imagine that you’re able to easily see the big, black, crystal located right in the middle of the table facet of one, while the feather along the edge of the other SI-1 clarity diamond is not at all visible to the naked eye. You might find yourself wondering how both of these diamonds can both be SI-1 in clarity. After all, the inclusions are blatantly obvious in one, and the other might be difficult for you to find even when using magnification. It’s important to remember that the diamonds were graded by a trained diamond grader with extensive experience evaluating diamonds using magnification. That person took the location, extent, and visibility of the inclusions into account when determining the clarity grade. Earlier, I touched on the fact that the visibility of inclusions depends on the individual vision of each person who is looking at the diamond. This is an important fact to remember when deciding whether to buy an SI-1 or SI-2 clarity diamond that is described as “eye clean” because whether you agree with that assessment will depend on your personal vision. Keep this in mind when shopping for SI-1 or SI-2 clarity diamonds. The industry method for determining whether a diamond is “eye clean” is this… A trained grader picks the diamond up in tweezers and glances at it from a distance of 9-12 inches. 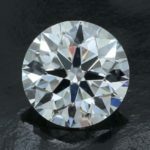 If the inclusions are not “readily and immediately visible” to a trained grader, the diamond is deemed to be eye clean. But this doesn’t mean that the diamond will be 100% eye clean if somebody has very keen vision and/or scrutinizes the diamond closely. Which is why you should consider nothing less than VS-2 clarity if you truly want the diamond to face-up eye clean under scrutiny. Which is not to say that the inclusions within SI-1 or SI-2 clarity diamonds are always easy to spot. Oh, no, nothing could be farther from the truth. The reality is that some SI-clarity diamonds contain inclusions that are “readily and immediately visible” and you might be hard-pressed to find the inclusions within other SI-clarity diamonds even with magnification. It practically goes without saying that the SI-clarity range represents the largest spectrum of inclusion possible. Everything that is higher than I-1 in clarity and lower than VS-2 in clarity, finds its way into the SI-1 or SI-2 clarity grades. Simple enough, right? Of course, that simple fact makes it all the more challenging to buy an SI-clarity diamond without a great deal of guidance. Thankfully, Brian Gavin personally evaluates every diamond signed with his signature, so we can walk you through the inclusions and help you select a diamond that meets your preferences. Before we go much further, it’s probably a good idea to get some perspective on the degree of magnification used in the diamond clarity photographs we’re going to be looking at. While the industry standard for diamond clarity grading is 10x magnification, we prefer to use ±35x magnification so that you can identify the inclusions quickly and easily. In our experience, using anything less than 35x magnification makes it more difficult for you to see inclusions clearly on a computer monitor. At the same time, the downside of using such a high degree of magnification is that the inclusions appear to be larger than life. Some people freak out over the size of the inclusions and how easily they can be found at 35x magnification. It’s important to keep things in perspective and remember that you’re looking at the diamond magnified 35 times! In order to put things back into perspective, we photographed this U.S. Dime on our imaging system using the same settings we use to capture diamond clarity photographs and video. As you look at all the detail that is apparent on U.S. Dime as it now appears on your computer monitor, keep in mind that the average diameter is only 17.9 millimeters. 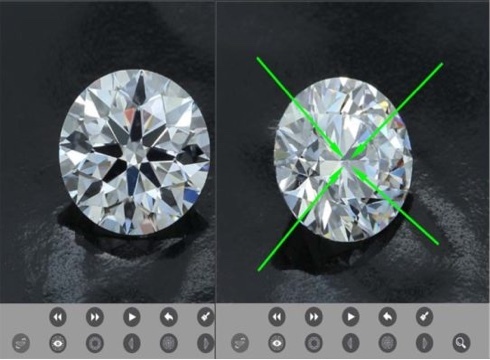 Remember this visual aid when evaluating the diamond clarity photographs and video provided for Brian Gavin Signature diamonds, so that you’ll have perspective regarding the inclusions. I once heard a friend of mine describe the VS-1 and VS-2 clarity range as the sweet spot of diamond clarity to a client. That’s because the VS-clarity grades represent the middle ground of diamond clarity and price. Most people (read 99.999%) view VS-2 clarity diamonds as facing-up eye clean. The exception to this rule might be people with extraordinary vision, or the “lucky VS-2 clarity diamond” which is really closer to an SI-1, or what we commonly refer to as a diamond that is sitting on the fence. Which would be a diamond that contains inclusions which one grader might deem to be VS-2 while another person might see it as more of an SI-1. The reality of course is that diamonds are graded by people, and as such, the grading process is subject to interpretation. Everybody has good days and bad days at work, right? Which is why Brian Gavin grades each diamond prior to submitting it to the laboratory, so that he’s familiar with the characteristics and has the knowledge and the insight necessary to challenge the grade up or down, if need be. But generally speaking, the odds are that you’ll find the majority of VS-2 clarity diamonds graded by the AGS Laboratory, or GIA Laboratory, will face-up eye clean. Which is why most people prefer VS-2 clarity diamonds for their engagement rings… they’re going to face-up eye-clean and the price falls in the middle of the spectrum, which makes them more affordable. If you have keen eye sight, or simply prefer the idea of a higher clarity grade, then you might choose a VS-1 clarity diamond because the inclusions will be even smaller and more difficult to locate using magnification. I’ve never heard of anybody who was able to see the inclusions within a VS-1 clarity diamond with just their eyes in the face-up position. The higher up the diamond clarity scale you go, the more difficult it becomes to identify inclusions within a diamond using 10x magnification. Diamond prices also increase accordingly because diamonds of higher clarity are rarer than diamonds that are more heavily included. With that in mind, the VVS-2 clarity grade is used to describe diamonds which contain inclusions which are very, very difficult to locate using 10x magnification. The VVS-1 clarity grade is used to describe diamonds which contain inclusions which are extremely difficult to locate using 10x magnification. That makes sense, doesn’t it? I think it makes more sense than simply saying that a VVS-clarity diamond is Very, Very Slightly included, which is what the letters stand for. As you might imagine, most people feel like they’re burning the eyes out of their head while trying to locate the inclusions within VVS-clarity diamonds with a handheld 10x diamond grading loupe. It is actually quite challenging to find inclusions within VVS-clarity diamonds with a microscope, unless you happen to know where and what to look for, and more than likely, you’re going to crank up the magnification to something like 30-40-50x and then work your way back down to 10x magnification. If you’ve been paying attention, then you know that the industry standard for diamond clarity grading is 10x magnification. The reason why I’ve been drilling this fact into your head, over and over again, is because this is a concept that trips up a lot of people. An internally flawless clarity diamond is one which a trained grader was unable to see any inclusions within the diamond using 10x magnification. However, there may be minor blemishes on the surface of the diamond which are visible using magnification. It is important to realize that what might not be seen under 10x magnification, might be visible when examining the diamond using a higher degree of magnification. 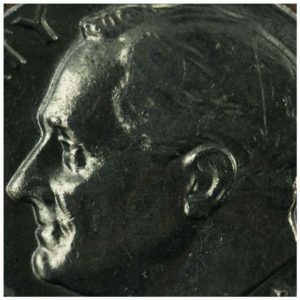 Once again, remember the photograph of the U.S. Dime pictured above and how much larger than life it looks at 35x magnification. Everything in life is a a matter of perspective, right? It only makes sense that you might be able to find inclusions within a flawless or internally flawless diamond when using a higher degree of magnification than the rest of the industry. Of course, you might also be looking at a speck of dust or a water spot and not any sort of inclusion at all. When in doubt, feel free to ask our customer service team for guidance. And remember that the characteristics of every Brian Gavin Signature diamond were determined while being graded by an independent gemological laboratory. Keeping in mind that the purpose of the GIA Diamond Clarity Scale is to provide us with a method for determining the rarity of one diamond as opposed to another and determining the value of that diamond in comparison to others, the flawless diamond clarity grade represents the tip of the iceberg. A diamond may be graded as Flawless in clarity, when a trained grader is unable to locate inclusions or blemishes using 10x magnification. Remember that inclusions may be visible if the diamond is examined using a higher degree of magnification. “Flawless” is only “Flawless” at 10x magnification and beyond that, a microbe or two might be visible. It goes without saying that a picture is worth a thousand words. It’s one thing to have a description of what each diamond clarity grade represents, and another to see what that might look like, right? Keep in mind that every diamond is individual and unique. No two diamonds are known to contain the exact same inclusion types, in the same places, and the same size, color, etc., thus these images are solely intended as examples of what each clarity grade might look like. 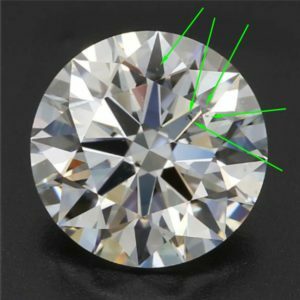 By the end of this diamond clarity grading tutorial, you should have a better understanding of what each of the different clarity grades looks like and find it much easier to identify inclusions within diamond clarity photographs and video. Keep in mind that inclusions are located at different depths within diamonds, thus they may not always be as easy to see as you might think. At the same time, being able to see an inclusion fairly easily in a clarity image does not mean it will be easy to find with a 10x loupe. I’m going to try and make it easy for you to get started by pointing out the way, by using little green arrows to highlight the primary inclusions responsible for each clarity grade represented. This is a photograph of a 1.20 carat, G color, I-1 clarity, GIA Excellent cut round diamond as seen using 10x magnification, the industry standard for diamond grading. As you can plainly see, the black and white inclusions within this diamond are clearly visible without any effort whatsoever. It practically goes without saying that you will be able to see the inclusions within this diamond with just your eyes if you have average vision. At the same time, the portions of the diamond which are not heavily included face-up fairly clear and that might appeal to somebody. As you can see, there is no need for me to add arrows to the clarity photograph to point out the inclusions, they are readily and immediately visible without magnification. In addition to being heavily included, as is typical of I-2 clarity diamonds, this diamond is also leaking light all the way around the table facet, as indicated by the ASET Scope (middle) and Ideal Scope (right) images. That is what the translucent sections along the edge of the table facet indicate. The leakage is also visible as light brown to darker brown areas under the table facet in the clarity photograph. The fact that this diamond has an overall cut grade of GIA Excellent just goes to show that not all ideal cut diamonds are cut the same. 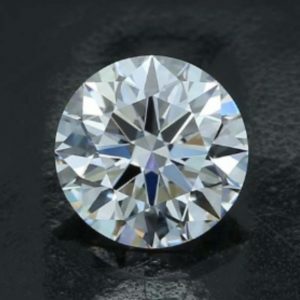 The odds are that if this diamond were cut to better proportions and a higher degree of optical precision that it would exhibit much better light return in spite of the inclusions. This is a clarity photograph of this 2.018 carat, K-color, SI-2 clarity, Brian Gavin Signature hearts and arrows round diamond. The primary inclusions responsible for the SI-2 clarity grade are the cluster of crystals located in the middle of the table facet, as indicated by the green border which I’ve drawn around them to make it easier for you to see. There are also a feather and crystal located along the edge of the diamond, but those inclusions are not visible from this vantage point. This is the nature of inclusions within a diamond, they are not always visible at the same focal depth. This diamond was graded SI-2 because the inclusions were “readily and immediately visible” to a trained grader as seen under 10x magnification, but that does not mean that the inclusions will be obvious to the casual observer. We’ve deemed this SI-2 clarity diamond to be eye clean because the inclusions are not readily and immediately visible to the naked eye. However, you may still be able to see the inclusions within this diamond if you scrutinize it closely and/or have very good vision. SI-2 clarity diamonds like this one are a good option for people who want to maximize the carat weight available within their budget, and who don’t mind the possibility of being able to see an inclusion or two in exchange for that benefit. Keep in mind that most people will not get close enough to your engagement ring to see the inclusions, nor do they have the experience necessary to identify the inclusions without magnification. This 1.732 carat, G-color, SI-1 clarity, Brian Gavin Signature hearts and arrows diamond is an example of a really nice SI-1 clarity diamond that we feel is on the high side of the scale. The primary inclusions located under the table facet are not readily visible without magnification, but they’re right there if you know where and what to look for. 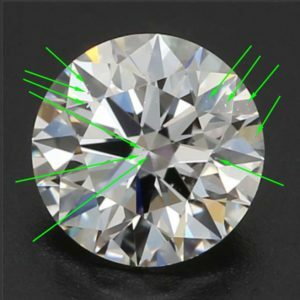 With that in mind, the inclusions within a diamond are not always going to be staring you in the face, even when things seem so simple on the plotting diagram provided on the diamond grading report. To begin with, it is important to remember that plotting diagrams are one-dimensional representations of a three-dimensional object. It’s like trying to figure out what a mountain range looks like by looking at a road map. Which means that you might have to twist things around to find what you’re looking for, so that’s what we’re going to do. The formation of diamond crystals and clouds of pinpoint size diamond crystals is located right in the middle of those four green arrows. Keep in mind that you’re looking at those inclusions as seen through our imaging system at approximately 35x magnification. Clearly, this is a high-end SI-1 clarity diamond, which sets the bar pretty high for the rest of the diamonds in the spectrum. The inclusions are a little easier to find within this 2.70 carat, H-color, SI-1 clarity, Brian Gavin Signature round diamond because some of the crystals are darker, but the diamond still faces-up eye clean by industry standards. 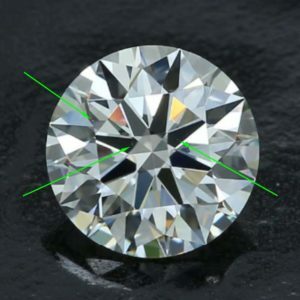 The primary inclusions responsible for the clarity grade are highlighted with green arrows. This is more of a textbook SI-1 clarity diamond, although it still falls on the high-side of the spectrum because the inclusions are pretty small, and most are located off to the edge of the table facet. These are the types of SI-1 clarity diamonds that set the bar pretty high. Note that the darker crystal inclusion reflects within the facet structure several times. This type of optical illusion is fairly common because every facet of the diamond acts like a mirror which can reflect the inclusions so that they appear to be in multiple locations at the same time. Interestingly enough, this effect is usually only visible when the diamond is being viewed through the imaging system. 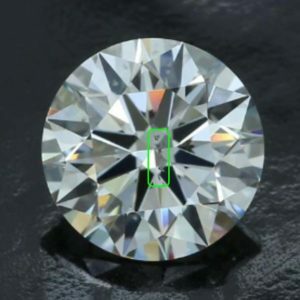 This 1.071 carat, E-color, VS-2 clarity, Brian Gavin Blue fluorescent diamond offers us another great learning opportunity because the inclusions are primarily translucent and minute. Once again, the primary inclusions are not that easy to find when the diamond is viewed in the face-up position. We could make it easier and point them out, since we know where they are, but this is an exercise in learning how to identify inclusions. We want you to develop the skill of finding the inclusions on your own to some extent. So now that the diamond is tilted back slightly, we’re able to see the tiny, dust-like crystals and feathers which comprise the primary inclusions. While none of the inclusions are very large, there are a fair amount of them and that is what qualifies this diamond for the VS-2 clarity grade. Remember that it’s not only the size of the inclusions, but also the number, and the tone of the inclusions that determines the clarity grade. The more prominent of the inclusions are highlighted with green arrows, we didn’t highlight the smaller inclusions because it seemed unnecessary because we want you to focus on the primary inclusions and not the minutia. This 1.097 carat, F-color, VS-1 clarity, Black by Brian Gavin hearts and arrows diamond contains a small “cloud” of pinpoint size diamond crystals as the primary inclusions. Only one of the crystals is really visible from this vantage point, we’ve highlighted it with a green arrow for your convenience. Perhaps this would be a VVS-2 clarity diamond if those were the only inclusions, however there are “other clouds not shown” on the plotting diagram. If you look closely, you can see traces of the other inclusions in this clarity photograph. Of course, you’re looking at the diamond at 35x magnification, so that’s not really surprising. The minute inclusions within this 1.228 carat, J-color, VVS-2 clarity, Brian Gavin Signature hearts and arrows diamond were a real challenge to find. Part of the challenge is that only one of the inclusions is plotted within the upper half of the diamond, which means that the pinpoints located in the lower half may still be visible, but they might not seem as prominent as the pinpoint in the upper region. However, that assumption is not always true, the nature of inclusions is that they are tricky beasts which like to hide and peek out from behind the corners of the facets. We’ve highlighted the pinpoints with green arrows to make them easier to find. You might be hard-pressed to see the inclusions within this1.058 carat, G-color, VVS-1 clarity, Black by Brian Gavin hearts and arrows diamond. As you might expect, there isn’t much to see inside of this 1.02 carat, D-color, Internally Flawless, Brian Gavin Signature hearts and arrows round diamond. That’s because the diamond is graded by the AGS Laboratory as being Internally Flawless in clarity. 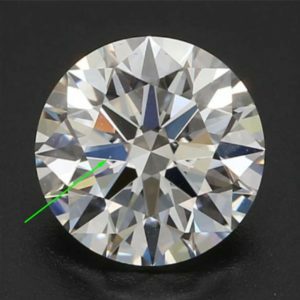 As you now know, that means that a trained grader was unable to find any inclusions within the diamond using 10x magnification, which is the industry standard for diamond grading. There may be some minor blemishes on the surface of the diamond, but I’m not able to find anything. Unfortunately, we don’t have a photograph of a flawless Brian Gavin Signature diamond to show you at this time, but hopefully we’ll have one soon. At which point, we’ll add a photograph to this page so that you can see there is no difference between how it faces-up next to the internally flawless. Once again, as with most things in life, choosing the right diamond clarity is largely a matter of perception once you cross over the line between SI-1 and VS-2 clarity, because everything is going to face-up eye clean from that point forward. The reality is that nobody is going to be able to see the difference between a Brian Gavin Signature diamond that is VS-2 clarity or Internally Flawless from across the dinner table. The only thing that they’re going to be able to focus on is the incredible light performance and sparkle factor. And to that regard, “it’s all in the hearts” as Brian Gavin is fond of saying. Ultimately, the number one factor that dictates the visual performance of your diamond is the cut quality. 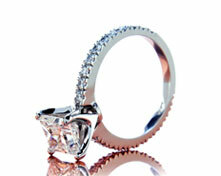 The mistake that most people make is assuming that AGS Ideal-0 or GIA Excellent cut is good enough. When the reality is that the gemological laboratories fail to take optical precision into account as part of their grading criteria. Don’t worry, this is where Brian Gavin Diamonds SHINE beyond all others, because they are cut to exhibit the highest degree of optical precision. The proof is in the sparkle. You’ll know you made the right choice, when you see the sparkling personality of that Brian Gavin Signature diamond on her finger! *GIA diamond clarity scale and chart images are Copyright © the Gemological Institure of America, all rights reserved.